While the Enterprise undergoes a routine baryon sweep that forces the entire crew to evacuate, terrorists attempt to steal a dangerous warp engine by-product and only Captain Picard can stop them. It's interesting that an episode in which Picard is essentially an action hero starts out with a long sequence showing us what a masterful micromanager he can be. Whether it's knowing where to get a spare stasis module for Dr. Crusher or stopping space pirates with a crossbow, Picard is a savant at thinking on his feet. The stuff with Data mimicking Commander Hutchinson is priceless. Cracks me up every time. Data mentions the Sheliak, which were seen in "The Ensigns of Command." Do you think Picard knows how to do the Vulcan neck pinch because of his mind-melds with Sarek and Spock? There's a lot of death going on. While Picard doesn't directly kill anyone, at least three of the terrorists die as a result of his actions, not to mention whoever was on the shuttle. And, since I'm on the subject, is Hutch dead? 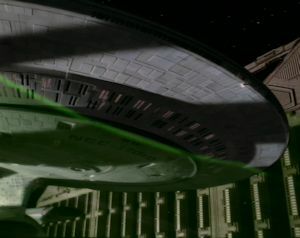 There are only a handful of TNG episodes that can be considered straight action vehicles, but this is one of the most ingenious. While the basic set-up is just Die Hard in space (as though there is something wrong with that), the plot has plenty of tricks up its sleeve, starting with the baryon sweep, a constant source of urgency that keeps the story moving at a brisk pace. The instability of trilithium resin is another perfect plot device for adding tension and offering Picard a way to cleverly win at the end. There's not much in the way of character development or cool sci-fi, but even an episode that is designed to be nothing more than exciting can be well-written. The pirate that Picard uses the Vulcan neck pinch on is played by Tim Russ, who will go on to play the Vulcan Tuvok on VOY.